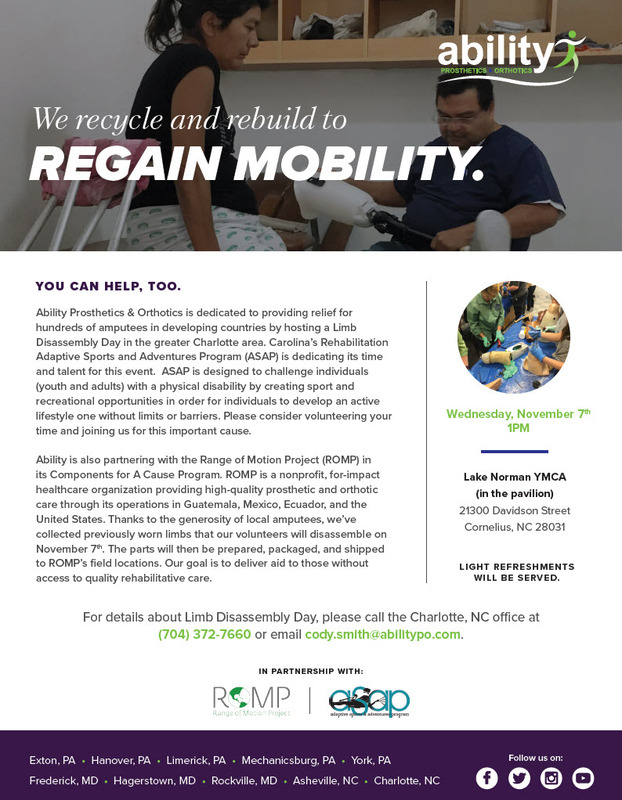 Ability Prosthetics & Orthotics is dedicated to providing relief for hundreds of amputees in developing countries by hosting a Limb Disassembly Day in the greater Charlotte area. Carolina’s Rehabilitation Adaptive Sports and Adventures Program (ASAP) is dedicating its time and talent for this event. ASAP is designed to challenge individuals (youth and adults) with a physical disability by creating sport and recreational opportunities in order for individuals to develop an active lifestyle; one without limits or barriers. Please consider volunteering your time and joining us for this important cause. Ability is also partnering with the Range of Motion Project (ROMP) in its Components for A Cause Program. ROMP is a nonprofit, for-impact healthcare organization providing high-quality prosthetic and orthotic care through its operations in Guatemala, Mexico, Ecuador, and the United States. Thanks to the generosity of local amputees, we’ve collected previously worn limbs that our volunteers will disassemble on November 7th. The parts will then be prepared, packaged, and shipped to ROMP’s field locations. Our goal is to deliver aid to those without access to quality rehabilitative care.